'We lolled in the sea until it was time to return for tea, another of Mother's gastronomic triumphs. Tottering mounds of hot scones; crisp paper-thin biscuits; cakes like snowdrifts, oozing jam; cakes dark, rich and moist, crammed with fruit; brandy snaps brittle as coral and overflowing with honey. Conversation was almost at a standstill; all that could be heard was the gentle tinkle of cups, and the heartfelt sigh of some guest, accepting another slice of cake.' 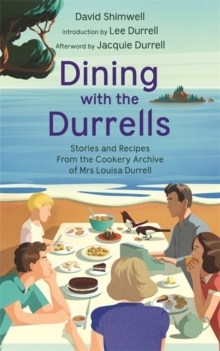 - My Family and Other Animals, Gerald DurrellIn Dining with the Durrells, David Shimwell has delved into the Durrell family archives to uncover Louisa Durrell's original recipes for the scones, cakes, jams, tarts, sandwiches and more that are so deliciously described by the Durrell family. 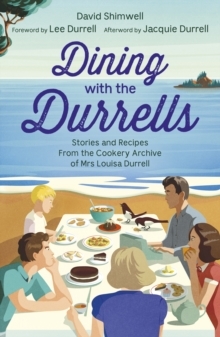 From her recipe for 'Gerry's Favourite Chicken Curry' to 'Dixie-Durrell Scones with Fig and Ginger Jam', and including the family stories and photos that accompany them, this book will transport you to long lunches enjoyed on the terrace of a strawberry-pink villa, sunshine-filled picnics among the Corfu olive groves and candlelit dinners overlooking the Ionian Sea.